Much like in 2011, when the Wellness Survey was last conducted, the 2013 results suggest that organizations are still largely focusing on methods of cost control that empower employees to make better decisions related to their overall health. In particular, the top two methods of cost control, “educating employees to be better health consumers” and “creating wellness programs” (both used by about two-thirds of employers) rely heavily on employees to make well informed choices. It is also worth noting that while both of these options rely heavily on employees, they also give employers the opportunity to influence and structure the various programs that fall under these categories in order to fit the organization’s workforce demographics and culture to maximize the effectiveness of the programs. Fairly straightforward, this option was popular among nearly half of employers, who simply took a good hard look at how their health insurance plans were structured and made changes to the plan design itself to curb costs. In some cases, this ultimately meant switching to self funded health insurance or changing insurance vendors altogether. While the strategies employed by organizations that fall under this category are not always recommended, some, like placing limits on spousal or charging tobacco users slightly more in premiums are less controversial than others. For example, according to the Wellness Practices Survey, 37% of employers manage their healthcare costs by increasing costs such as copays and deductibles. While having to tell employees they will have to pay more money to see a specialist or fill a prescription is not an enviable position, these incremental changes are far less challenging for an organization overall than “reducing hours to less than 30 hours per week”- a method used by only 5% of the overall sample. 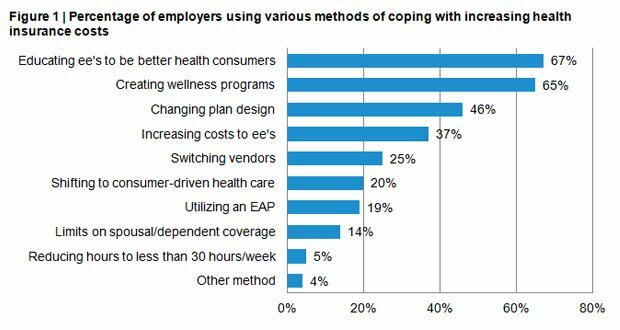 See Figure 1 below for a complete listing of the strategies used by employers to control health insurance costs or for additional information, download the 2013 ERC Wellness Practices Survey.